Ever since we first saw concept art for Disney’s latest animated feature Frozen (now playing at a theatre near you! ), we’ve all been obsessed with Elsa, the Snow Queen. Her beauty. Her dress. Her sass. Her voice. Her awesome ice magic! 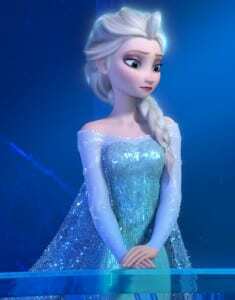 Even the naysayers of Frozen will admit that Elsa is stunning. 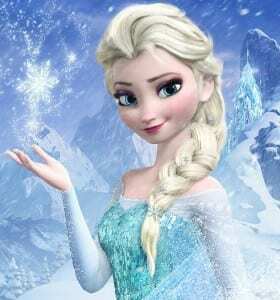 Elsa, the oldest Disney Princess at the ripe ol’ age of 21, is the newly crowned queen of the kingdom of Arendelle. Unlike other Disney Princesses who are happy and chipper most of the time, Elsa has a secret she refuses to divulge: she has the power to create and control ice and snow. 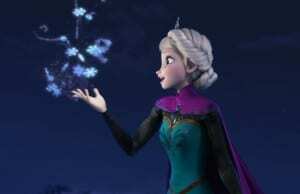 This power haunts Elsa because during her childhood, it nearly took the life of her younger sister, Anna. Growing up, Elsa was taught to control her powers, hiding them from everyone including her sister, concealing and not feeling. When the time comes for Elsa to be crowned queen, circumstances cause her to unleash her incredible powers, causing people to panic and label her a witch. Afraid and confused, Elsa flees to the mountains, where she lets her power run free and becomes known as The Snow Queen. Never in Disney history have we had a female character as conflicted and complicated as Elsa (a quick canon run through reveals Megara from Hercules as the closest possible contender). Voiced brilliantly by Idina Menzel (known for originating the role of Elphaba in Wicked, a similarly gray role), Elsa is not, like other princesses, happy go lucky. Disney has created a dark, mature, central female character, whose greatest challenge is finding acceptance–not just from others–but from herself as well. Critics argue that unlike her sister, Elsa is largely a bland and underdeveloped character, who takes a backseat to Anna in the movie. However, it must be said that the movie does a great job of bringing to light Elsa’s internal psychological struggle. Elsa is, by nature, reserved and poised, and honestly, that’s not boring at all. Not everyone can be as bubbly as Anna or Rapunzel all the time. If anything, Elsa is mature and regal, with a demure befitting a queen. Elsa represents fear. Not a likely theme for a Disney Princess, you say? But it is what it is. The darkness of Elsa’s character is contrasted sharply with the sunniness of her sister Anna’s. While Elsa is serious and brooding, Anna is grinning and goofy. Elsa’s emotions manifest through her magic. When she’s afraid or angry, jagged ice spikes appear. In contrast, when she’s happy or calm, she produces beautiful swirls of snow. In fact, her fearful emotions plunge the kingdom of Arendelle into an eternal winter–right in the middle of July. 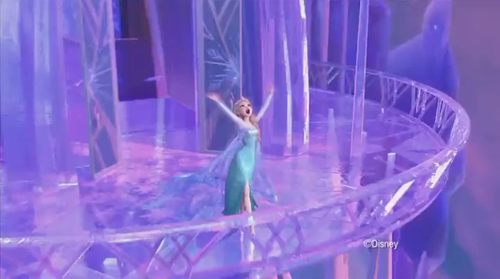 Elsa realizes she’s no longer held captive by that fear she’s lived in all her life. Unleashing her powers, she transforms herself, coming to the realization that “that perfect girl is gone”; the reign of the Snow Queen has begun. Elsa is the poster child for introverts who prefer to live in isolation and not be bothered by interpersonal relationships or the demands of the world. How many of you would agree with the fact that Elsa is Disney’s LGBT icon? Hear me out: Elsa has lived all her life hiding her true self from the world. Then one day, she can’t hold it in any longer and she essentially “comes out”. She sings the anthemic Let It Go, a song about standing for yourself and not caring what the world says about you. It’s not surprising how many people from the LGBT community have already adopted Let It Go as their personal anthem, it is an empowering song that deals with breaking free from a difficult past and gaining the courage to believe in yourself. Not just members of the gay community, but people from all walks of life who have trouble accepting themselves and hiding their gifts can relate to Elsa. When Elsa flings away her crown, lets her hair down and creates a new persona for herself, it is visually symbolic of her own psyche: there is nothing holding her down any longer, and she is free to live her own life without any constraints. It’s interesting that Elsa doesn’t have a love interest in the movie. Fans were disappointed to learn that Anna gets both a sister and a boyfriend at the end of the movie, while “poor Elsa” only has to be satisfied with getting her sister back. This viewpoint, while legitimate, is flawed. All Elsa wanted was acceptance. And she does get that. Elsa doesn’t really care about having a boyfriend the way Anna pines for romance. Elsa’s biggest conflict is coming to terms with herself. As much as Anna’s struggle is external, Elsa’s is internal. Anna wants her sister back, and also wants to find romance. Elsa just wants to be at peace with her immense power. By the end of the movie, we see that both the sisters get what they wanted, neither left disappointed. Young people can learn a lot from Elsa and her story. Never be afraid of your abilities. No matter how different you may seem, embrace what makes you unique and accept yourself for who you are. For Elsa to gain acceptance of the world, she first had to come to terms with herself and her powers. How much more beautiful could a movie message be? Elsa is easily one of the greatest female characters Disney has ever created. Her mental anguish and uncontrollable powers define modern feminism. Elsa represents the boundless female spirit- strong and graceful, with the power to change the world. Disney’s Frozen is currently playing at theatres nationwide.